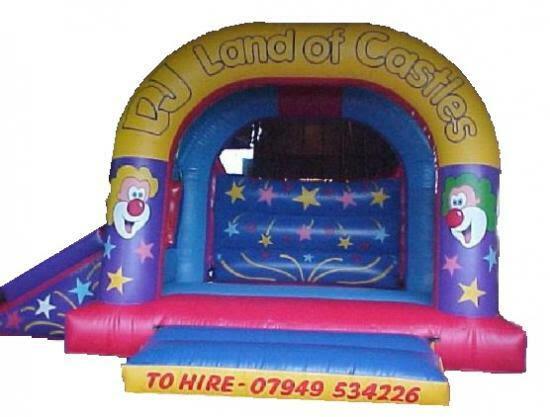 I have Used DJ land of Castles on a number of occasions and always been extremely pleased with the product and service. They are always on time and always keen to help.I have used the rodeo bull for the College to use during Sports Relief and also an Assault Course for South Liverpool Under 10�s Christmas party, which brought hours of fun and enjoyment.Would always use DJ Land of Castles before anyone else! dave of riverside college. had the big mickey slide on sunday,came on time the kids love it,will be getting again soon thanks for all your company did, to make are party go so well. thanks mrs jones. ps great price aswell. clown slide bouncy castle runcorn. Our 15ft x21ft Clown slide themed bouncy castle is popular with boys and girls and has amazing artwork of clowns faces on it and a slide on the side of the bouncy castle for more fun.This themed bouncy castle has a showercover so whatever the weather you can still have fun on our Clown slide theme bouncy castle so book on line to save the disappoint of missing out on you fun day.The required space you will need is 23ft x 17ft,the height of this bouncy castle is 12ft.If the bouncy castle is going indoors,please ensure the celing height of the venue where the bouncy castles going is higher than the bouncy castle.We deliver our themed bouncy castles, inflatable slides,rodeo bull hire,plus are assault courses and adult bouncy castles and domes,to Merseyside & Liverpool, Widnes, Runcorn, Wirral,Warrington, and St Helens, and some of these areas and further areas will be a additional fuel charge or toll/tunnel charge.Check our delivery checker on our home page,it will tell you if there is a charge for your area.